MSF is finally able to treat children in the village of Bagega now that a long-delayed program to remediate lead contamination is underway. 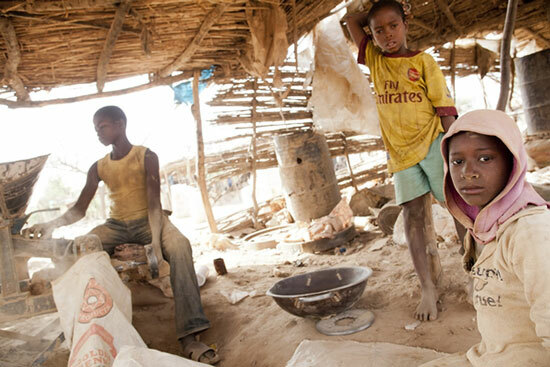 Children work at the gold processing site in Bagega. ABUJA, NIGERIA/NEW YORK, APRIL 23, 2013—Three years after the international medical humanitarian organization Doctors Without Borders/Médecins Sans Frontières (MSF) responded to an unprecedented outbreak of lead poisoning in Nigeria's Zamfara state, MSF is finally able to treat children in the badly affected village of Bagega now that a long-delayed program to remediate lead contamination is underway. However, only one of four sections of the village has been remediated, and MSF cannot effectively treat children from the remaining three sections until lead has been successfully removed from their homes. Acute lead poisoning, often caused by unsafe mining practices, can cause severe brain damage and death in children. In March 2010, MSF responded to reports of children dying mysteriously in communities across Zamfara state, northern Nigeria. An estimated 400 children died, and thousands more were discovered to have excessive and unprecedented levels of lead in their blood. MSF has treated more than 2,500 children in the state so far. "MSF is very happy to have finally—after three years—begun medical treatment in Bagega," said Simon Tyler, MSF country representative in Nigeria. "MSF is, however, acutely aware that this group is only the first of four needing urgent medical treatment in Bagega. The ongoing remediation must be completed before the rains come in order for us to reach all of the children in need in the village." Remediation involves the removal of lead-contaminated soils and mining and mineral processing wastes from the village, residential compounds, homes and buildings, common areas, wells, and ponds. Remediation is an essential condition for medical treatment—otherwise children are continually re-exposed to lead toxins, rendering the treatment ineffective. In Bagega, patients are divided into four groups according to when remediation of their houses is complete. In the remediated section of Bagega, MSF has started 34 children on specialized chelation therapy to remove the lead from their blood, and will monitor a further 126 children. In total, MSF expects to have between 600 and 800 children in Bagega under care. Remediation can only be carried out in the dry season. Delays in the release of urgently needed funding caused remediation to start late in Bagega, and these efforts have to be tripled before the rains come. "We have achieved more than we had hoped to in a very short time in Bagega, but our teams are under tremendous pressure to finish the remediation on a very tight schedule," said Simba Tirima, director of field operations for the TerraGraphics Foundation, which is overseeing the remediation process. "Unfortunately, ongoing procedural delays have also slowed our pace significantly. Now everything depends on the rains. We are working around the clock to ensure that all of the children of Bagega have every opportunity to receive treatment by MSF as soon as possible." Ultimately, solving the Zamfara crisis requires a triple approach: medical treatment, remediation, and safer mining practices. MSF maintains that safer mining practices must be introduced to ensure that people involved in mining and processing ore can do so without exposing themselves or others to lead poisoning. MSF is a medical humanitarian assistance organization that has been providing emergency medical services throughout Nigeria since 1971. MSF is not affiliated with any religion, government agency, or political party.